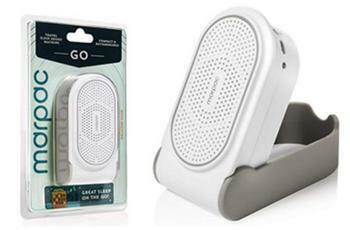 Marpac of Wilmington, N.C., is recalling about 5,000 GO travel sleep sound machines. The internal battery can leak and cause an electrical short, posing a burn hazard. This recall involves Marpac Go travel sleep sound machines, which produce numerous different types of sound that block out distracting noise. The multi-use sound machine is white with a gray flip stand, an internal rechargeable battery, and comes with a USB cable. It measures about 3 inches high by 2 inches wide with the serial number located on a sticker on the back of the machine. The sound machines, manufactured in China, were sold online at marpac.com, amazon.com, amazon.co.uk, harriscomm.com, and bedbathandbeyond.com from January 2019, through February 2019, for about $40. Consumers should immediately remove the sound machines from a charging source, stop using, and contact the firm for a full refund. Consumers may contact Marpac at (800) 999-6962 from 8:30 a.m. to 5:00 p.m. (ET) Monday through Thursday, 8:30 a.m. to 12:00 p.m. (ET) Friday, by email at customerservice@marpac.com or online at https://marpac.com/ and click on “recall notice” at the top of the page for more information.